What Is the Purpose of Molding and Trim in your Home? All of the baseboard molding, trim and crown molding are added to the floors and ceilings of the house. Each price of molding is cut to fit and mitered expertly to make clean corners throughout. For long walls, two pieces of molding will be jointed together and filler putty will make the seam barely visible. Once painted, the molding should appear as one solid piece. While most people choose to spend the biggest chunk of their home renovation budgets on the larger aspects of the construction job, you have to keep in mind that you need to spend a certain amount of money for the accessories that will complete the over-all look of your home as well. For example, you have to set aside a certain portion of your budget to have the necessary moldings and trimmings installed in your house. Not only will you be able to increase the aesthetic quality of your home, but you will also decrease the possibility of future wear and tear. There are many professionals you can hire to install molding and trim in your home. However, if you have the basic skills of construction and if you have the tools that are necessary for this type of job, you might as well carry on the process by yourself. There are a lot of resources that you may use to find out more about the process of the installation. While there are certain home designs that will not present the need for this type of installation, decor themes need the installation of moldings and trimmings for the over-all look to be completed. If your house blueprint specifies that you need these additions, then there is no other way for you to do the job than to incorporate them to your house's design. Yes, they would mean additional expenses on your part, but they are also the final pieces that will not only complete your home's design but also refine and polish it off as well. Choosing to skimp out on installing moldings and trim may present you with certain problems, the majority of which are purely aesthetical. Since you would be spending a large amount of money in building your home, you might as well ensure that you will end up with a house that you will be proud of. For this reason, you have to understand that installing moldings and trim is an imperative part of implementing a design. Without these, there is a possibility that you would have to deal with an incomplete look that will not be pleasing to the eye. There are also certain types of moldings and trim that perform certain functions, in addition to serving as eye candy pieces. For example, there are certain types of finishing that serve as hooks and hang-ons as well. For this type of installation, you have to see to it that you properly attach the finishings to the surface that will support the over-all weight. This way, you will be able to use them for whatever purpose without damaging any surface of your home and incurring more construction expenses. 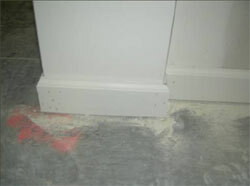 Molding and trim can be a very important component to a completed construction project. Molding and trim give a room the completed look that you desire. Many types of molding and trim can be purchased. Visit your local building supply store for samples of each. If you like a certain design, you may purchase a sample to take home and test out before buying. You should also consider whether or not you will be staining the molding with wood stain, or if you prefer white molding, you can purchase it in that color. Molding and trim are a finishing look that every home should have. Just like a package on Christmas morning with a bow, a home should have a completed look of molding and trim.